Natural product discovery from microorganisms provided important sources for antibiotics, anti-cancer agents, immune-modulators, anthelminthic agents, and insecticides during a span of 50 years starting in the 1940s, then became less productive because of rediscovery issues, low throughput, and lack of relevant new technologies to unveil less abundant or not easily detected drug-like natural products. In the early 2000s, it was observed from genome sequencing that Streptomyces species encode about ten times as many secondary metabolites as predicted from known secondary metabolomes. This gave rise to a new discovery approach—microbial genome mining. As the cost of genome sequencing dropped, the numbers of sequenced bacteria, fungi and archaea expanded dramatically, and bioinformatic methods were developed to rapidly scan whole genomes for the numbers, types, and novelty of secondary metabolite biosynthetic gene clusters. This methodology enabled the identification of microbial taxa gifted for the biosynthesis of drug-like secondary metabolites. As genome sequencing technology progressed, the realities relevant to drug discovery have emerged, the conjectures and misconceptions have been clarified, and opportunities to reinvigorate microbial drug discovery have crystallized. This perspective addresses these critical issues for drug discovery. I thank Heinz Floss and Chris Walsh for their many contributions to the field on natural product biosynthesis. I thank all contributors to this Special Issue of JIMB devoted to natural products. 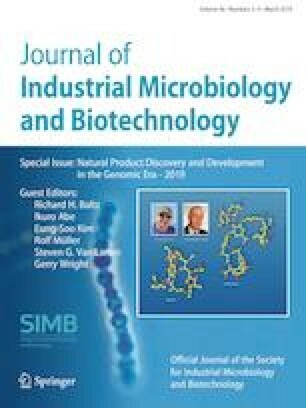 It is my hope that advances in natural product research continue at an accelerated pace, and contribute to a resurgence in natural product discovery, particularly for antimicrobials active against drug-resistant pathogens. As a father and grandfather, I look forward to the “Platinum Age” of natural product drug discovery for current and future generations.